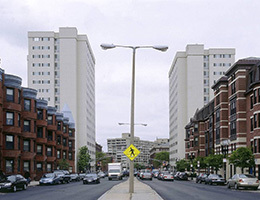 The Symphony Plaza Towers – East and West – were given their name due to the close proximity to Boston Symphony Hall, home of the famed Boston Symphony Orchestra. These buildings are located on the East and West sides of the street, and are conveniently within a half mile of Boston Medical Center, within a mile of Northeastern University, Fenway Park (home of the 2004 World Champion Boston Red Sox), The Isabella Stewart Gardner Museum and Boston’s Museum of Fine Arts. One of the many appealing characteristics of downtown Boston living, aside from its abundant history, is its access to public transportation. The Metropolitan Boston Transportation Authority (called the T) is the oldest and fourth largest public transportation system in the country. Symphony Plaza is located just above ground to the train route, and is within a half mile of many T bus routes. 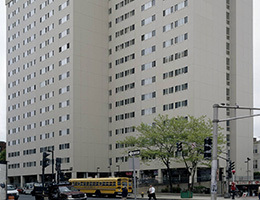 New England Affordable Housing Management Association (NEAHMA) has honored the Symphony Plaza with their prestigious Communities of Quality Award for Exemplary Development for the Elderly. A Community of Quality is certified as having achieved a high standard of excellence in the way they are managed, the services they provide residents, the experience and training of personnel, and other criteria. Symphony Plaza West is a smoke-free community.